The wind seemed to be picking up as we prepared to board the Kitty Kat, and I was a little worried about conditions in the strait. Luckily we barely made it out of our slip when first mate Josh spotted a whale. We slowly approached the south tower of the Golden Gate Bridge, humpbacks fluking on both sides of us and in front of us. One of whales near Fort Point did a couple of quick fin slaps before disappearing into very shallow water (somewhere between 50 and 60 feet). There was a lot of boat traffic, and several whale watchers expressed concerns about how fast other boats in the area were going. The whales were spread all the way underneath the bridge. 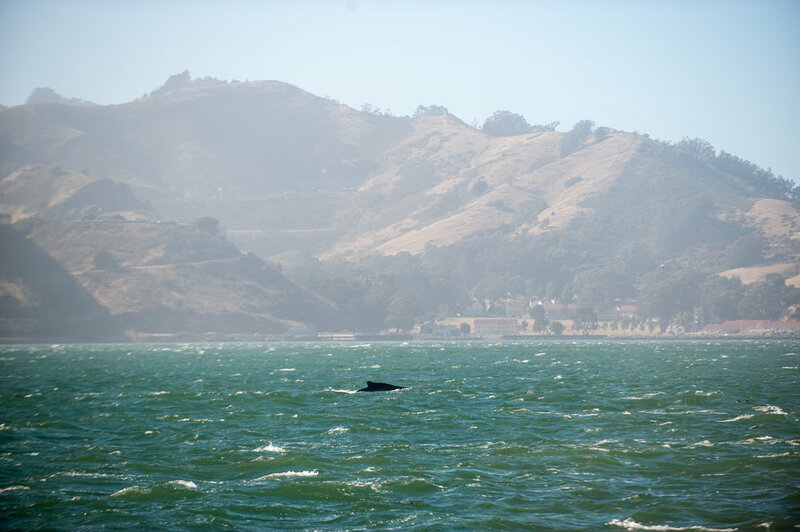 We counted at least six inside the bay, with more spouts beyond the Golden Gate. Our speed in neutral was 1.1 knots, indicating the speed of the current. We also noted harbor seals and harbor porpoises on this trip. As we headed back into port, we saw some Royal Terns feeding with the usual Caspian Terns, Common Murres, and Western Gulls. On my second trip of the day the whales were right where we left them. There were still at least six feeding inside the bay and many spouts farther away. We floated with the current as two humpbacks I suspected were a mother and calf pair spouted and dove together near the south tower of the bridge. A huge container ship passed through the Golden Gate to the north of us, and we saw decreased activity in that direction as whales started surfacing within 100 yards of our stern. There was a high concentration of kite boarders in the area, and a whale surfaced less than 40 yards from one of them. The whale's back is out of the water; the wind is quickly blowing the spout across the surface of the water. A large fuel ship passes under the bridge in the background. Near the beginning of the trip, I spotted three bright green balloons floating in the water. I notified the captain and we went into rescue mode. Our first mate Josh got out our large net and positioned himself on the starboard bow. The wind made it tricky, but with patience and teamwork we were able to remove two of the balloons. We lost sight of the last one and unfortunately did not see it again. The retrieved pieces were balloon swords commonly made at Pier 39; whales, seals, porpoises, and dozens of seabirds were in the area. Plastic in the ocean is a huge problem for wildlife, and it is our responsibility to remove it. The problem is so bad that we're even finding plastic in the sea salt we use for cooking! Find out more about reducing plastic in our oceans with Project Kaisei. Happy to at least have retrieved 2 of the 3 balloons! We had harbor porpoise and harbor seal sightings on this trip, as well as sightings of northern anchovies clasped in the beaks of birds. The captain noted the sonar was picking up readings of a large concentration of feed underneath the boat. All sightings were reported on Whale Alert and over the radio to the Coast Guard. Below are photos from passenger James Mancusi.